This is a prerelease of PSOA RuleML 1.0, whose schemas for XML serialization need to be finished, as well as the release of PSOATransRun 1.3, which executes PSOA RuleML 1.0's finished presentation syntax. The arXiv-maintained paper Perspectival Knowledge in PSOA RuleML: Representation, Model Theory, and Translation introduces both the PSOA RuleML 1.0 language and the PSOATransRun 1.3 system. In PSOA RuleML, a predicate application (atom) can have an Object IDentifier (OID) and descriptors that may be positional arguments (tuples) or attribute-value pairs (slots). 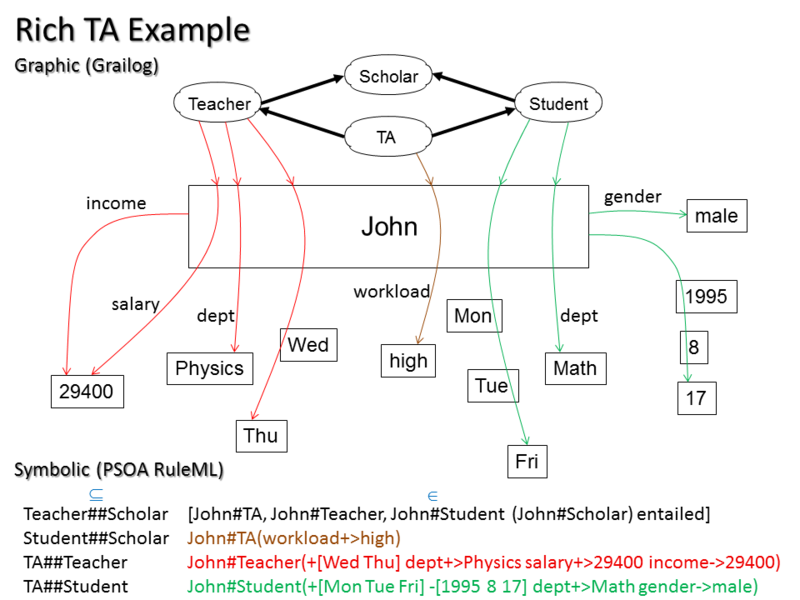 PSOA RuleML 1.0 specifies for each descriptor whether it is to be interpreted under the perspective of the predicate in whose scope it occurs. This perspectivity dimension refines the space between oidless, positional atoms (relationships) and oidful, slotted atoms (frames): While relationships use only a predicate-scope-sensitive (predicate-dependent) tuple and frames use only predicate-scope-insensitive (predicate-independent) slots, PSOA RuleML 1.0 uses a systematics of orthogonal constructs also permitting atoms with (predicate-)independent tuples and atoms with (predicate-)dependent slots. A slot attribute can thus have different values depending on the predicate. The open-source PSOATransRun 1.3 system realizes PSOA RuleML 1.0 by a translator to runtime predicates, including for dependent tuples (prdtupterm) and slots (prdsloterm).